Sept. 14, 2017, 1:19 p.m.
For years publishers have held onto the hope that all their investments in Facebook will, at some point, pay dividends when it comes to revenue. But a new report from WAN-IFRA suggests that, for most publishers, that’s still far from the case — and they’re not happy about it. Surveying nearly 50 WAN-IFRA members, University of Oxford researcher (and 2016 Nieman Fellow) Grzegorz Piechota found that Facebook was responsible for an average of seven percent of digital revenue, with a median of just three percent, across all of its revenue programs. A quarter of publishers said they received no direct revenue from Facebook at all. 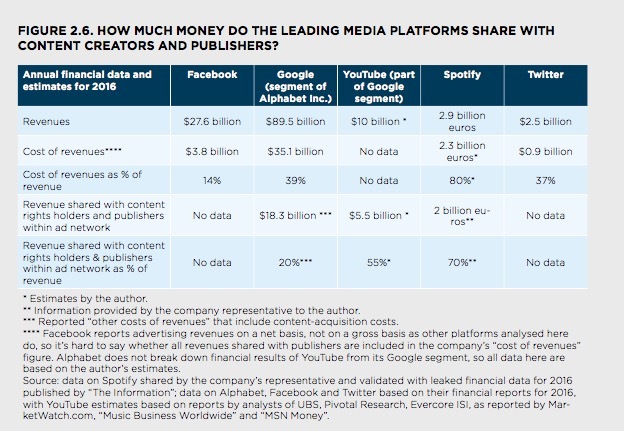 In Piechota’s estimate, this puts Facebook lower than Google, YouTube, and Spotify in terms of how much revenue is shared back with publishers, though the lack of complete data makes it difficult to draw direct comparisons. Piechota concludes that, overall, “revenue shared by the leading platforms is too low to fully fund editorial operations,” even for the largest organizations. 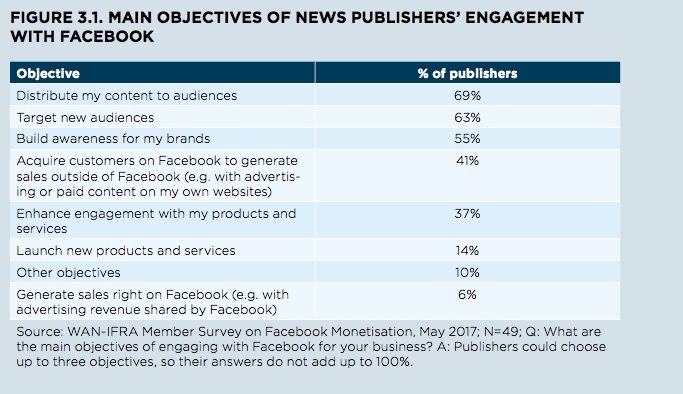 When WAN-IFRA asked us to research how news publishers make money on Facebook, we soon realised it was a sort of “mission impossible.” In general, publishers really do not make significant money on Facebook. Even leading news publishers in the U.S. that have embraced the idea of cross-platform publishing and have built vibrant communities on Facebook have not really been able to monetize their engagement with the platform’s products. This is obviously an area Facebook can improve, and it says it will. Publishers, as you might expect, aren’t too happy with the situation: Just 37 percent said they were satisfied or very satisifed with Facebook’s performance helping spread their branded content. And seven percent said they were satisfied with Facebook’s contributions to their display advertising businesses, which is the model for the vast majority of publishers today. Piechota’s big recommendation for how publishers should respond to this reality is a familiar one: Publishers aren’t building strong businesses on Facebook, and they shouldn’t try to. “To monetize engagement with Facebook and other platforms, news publishers need to build sound business outside of those platforms rather than outsourcing their future to them,” he writes. Bilton, Ricardo. "Are publishers making money on Facebook? “Not really,” a new report finds." Nieman Journalism Lab. Nieman Foundation for Journalism at Harvard, 14 Sep. 2017. Web. 20 Apr. 2019. Bilton, Ricardo. "Are publishers making money on Facebook? “Not really,” a new report finds." Nieman Journalism Lab. Last modified September 14, 2017. Accessed April 20, 2019. https://www.niemanlab.org/2017/09/are-publishers-making-money-on-facebook-not-really-a-new-report-finds/.